A Florida father of two boys decided that since his sons enjoy misbehaving to get attention, he’d give them even more attention by forcing them to stand along the side of the road as punishment. Hepburn said he’s had enough of his two sons acting out in school so he chose an un-orthodox form of punishment. Hepburn understands that there are two kinds of attention – wanted and unwanted – and hopes that this unwanted attention will shame his sons into following the rules at school. He says he hopes that his sons will learn that acting out in school is not a good idea. 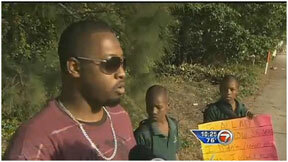 The father says his sons’ teachers say the boys aren’t following their instructions at school. There is no word on how long the father intends to impose this punishment on his two boys.